Mornings aren't my best time. Many of my journal entries reflect this. So this week I introduced a new way to finish my more challenged entries on a brighter note. anything to be grateful for. The activity helps to invoke a positive outlook. Energetically, it charges up the solar plexus (sun) energy centre, raising power, confidence and creative potential. There are occasions where my mind is not receptive to the word 'gratitude.' 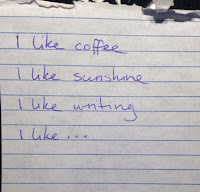 An 'I like list' is simply a softer version of the gratitude list. It is based on the same principles and has the same effect as a gratitude list. 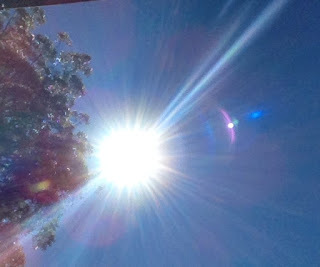 Both practices shine the light of our consciousness onto the aspects of our world that we feel positive about. Writing stalled last week, but that doesn't mean I'm not creating. As a writer I'm a bit like mushrooms: Under the correct conditions I will fruit all at once, but mostly I'm working away underground and out of sight. For me, creative energy is cyclical, sometimes introverted and sometimes extroverted. So even if I'm not working actively on my projects every day, I'm still thinking about them. The word has to be thought before it is written. Although the editing of my second book is excruciatingly slow at the moment, I have been journaling daily - sometimes several times daily. My writing hand and my writing voice are still being exercised in private. A break from blogging wasn't part of the plan for April. Screen burnout is a thing and I had it. I may still have it. But there are a few exciting things I need to talk about this week. This term of Majickal Bellydance includes choreography. I have enjoyed writing a new spiritual dance to share with the class. I have also revised an old favourite, one that makes me smile. I hope it makes the dancers of Seville smile too. 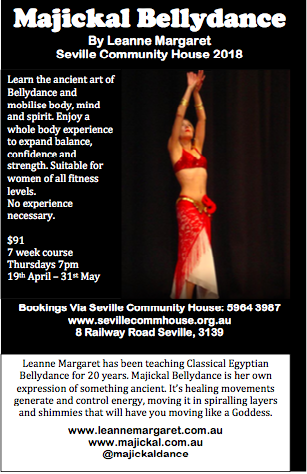 I'm really pleased that class begins again this Thursday 19th April. Writers' group begins again at Seville Community House this Wednesday 18th April. This group is run by crime-fiction author Debra Marks.